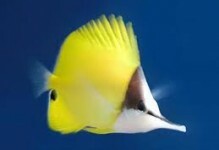 The Double Saddle Butterflyfish, also known as the False Falcula Butterflyfish, Doublesaddle Butterflyfish, or Saddled Butterflyfish, is white with thin, vertical black lines across the body. 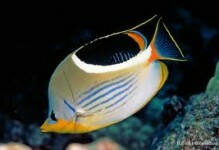 The posterior portion of the body is yellow with a black spot on the tail. 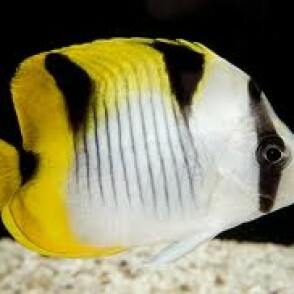 It also has two black patches on the body (dorsal side) and a black eye band. 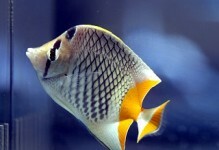 A 120 gallon or larger aquarium with other butterflyfish, hiding places, and plenty of space to swim is a good environment. 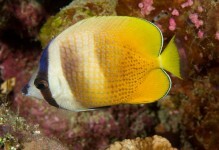 It is not an acceptable addition to a reef tank since it will eat mushroom corals, anemones, and stony corals. 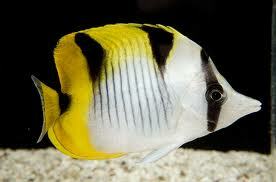 The diet for the Double Saddle Butterflyfish should consist of different meaty items and some vegetables.